Build great courses complete with games, quizzes and exams. Import courses from popular SCORM/AICC/xAPI-compliant authoring tools. Create blended training plans with our Instructor-led Live training. Whether you have 100 or 10,000 users or more, SmarterU LMS will scale to meet your needs. It’s not just a matter of speed - we’re fast. It’s also a matter of how the system is designed – managing a huge number of users, courses, and records just works. Create and manage an unlimited number of courses, plus categorize them into folders. Within each course, have an unlimited number of chapters, tasks, games, quizzes, and graded exams. Build your course right in SmarterU - you don’t need any special skills or programming background - we’ve made it easy. Organize your course with chapters and choose from a variety of task types to create engaging and effective training. Add images / graphics to your content to illustrate the important points you want learners to retain. 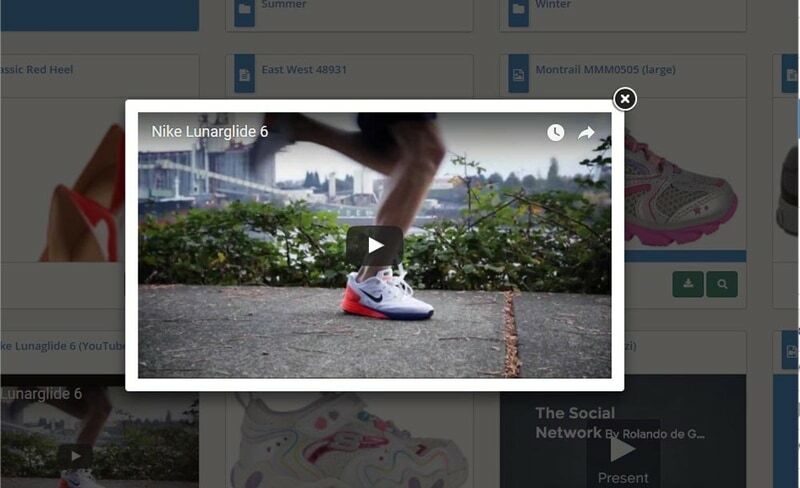 Upload videos or embed Youtube or Vimeo videos and flow text around them. Include links to external resources such as Wikipedia. Create tables to organize your content or layout your slides. "Everyone has been very helpful and professional, and our designs for the LMS came out great!" "I find that the user experience is an easy one. SmarterU is a powerful tool that helps us create courses for our associates and enables us to track the progress." "SmarterU has a great support team and our account manager is knowledgeable and always helpful. We've had great customer service, and the application is always being enhanced to keep them on the cutting edge." Need audio and narration? No problem. Add audio or narration to your course materials - upload pre-recorded narration or use our text-to-speech narration. 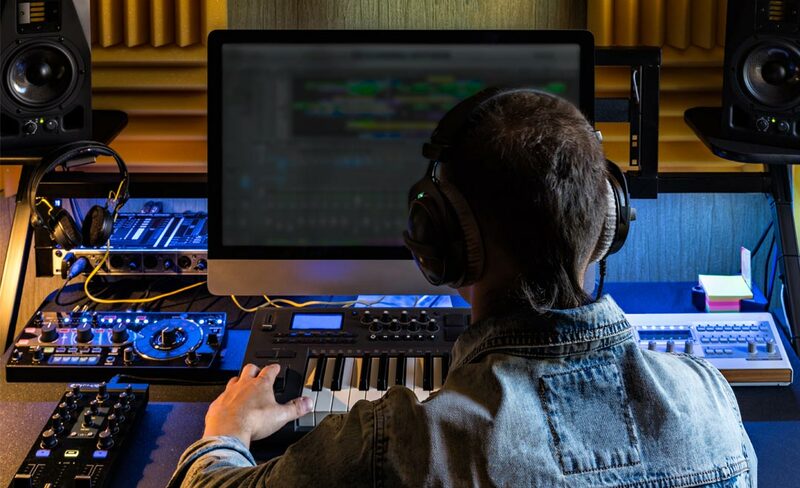 Audio narration can be set to start automatically, or the learner can press Play to listen to the audio file. Upload PowerPoint presentations, preserves animations and narrations. Your presentation will look exactly as you’ve designed it. Upload PDF files as links, or embedded within a course task. Your learners all have a variety of roles and training requirements specific to those roles. Engaging learning often includes video. With the SmarterU LMS you have choices – video box with annotations, slide-width, and full-screen video options are available. Upload a video and we’ll optimize it for immediate playback. Plus embed video from sources, such as YouTube and Vimeo. 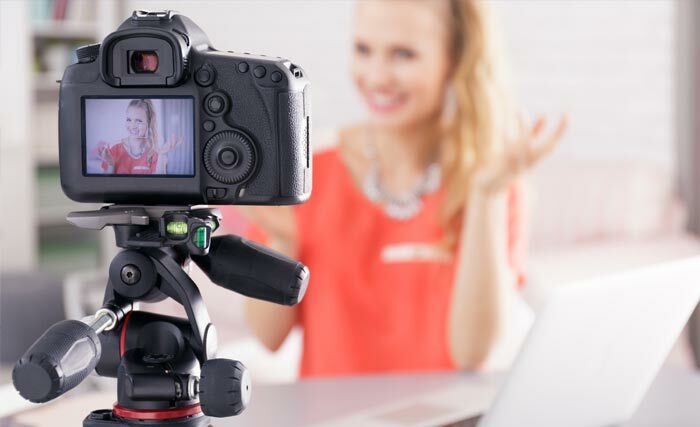 Choose how you want your video to display - quarter, half, or full-screen width. Use our video annotation system to add text or graphics as a synchronized accompaniment to your video. 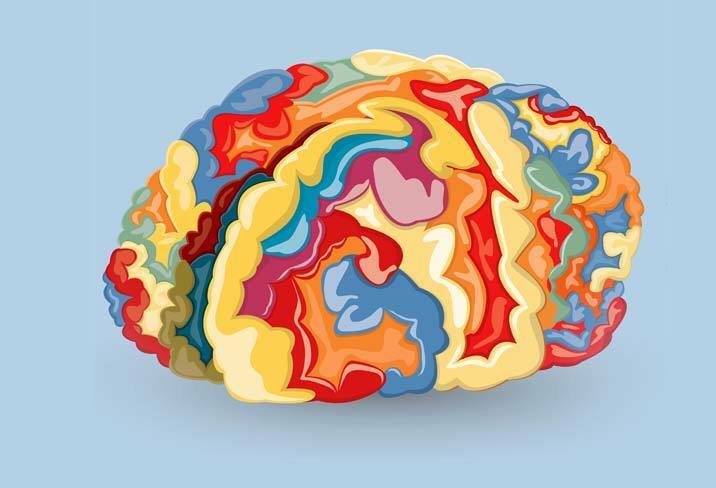 Need your learners to memorize facts? There is no better proven method than using flashcards for knowledge drills. Create a deck and your learners can keep going through the cards until they achieve mastery. Our digital double-sided cards can contain text, images, or other media. Boost memorization and recall based on the course material. Flashcards can be set in sequential order or can be randomized. Learners can return to flashcards as often as they wish, to be drilled on the facts they need to know to pass the quiz ahead. Practice is the key to retention! SmarterGames™ are designed as ungraded, fun learning games you can sprinkle throughout your course material to provide your learners with opportunities to practice what they’ve learned. 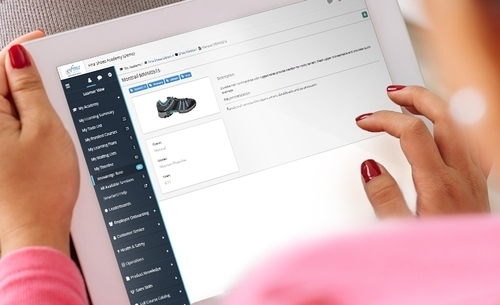 Separate your content into sections divided by interactive games. Your learners will have an opportunity to practice and assimilate the course information. SmarterGames™ are intentionally not graded, allowing the learner to freely practice, but they can only move forward in the course after successfully completing the game. Pick one of our predefined themes or customize the colours and style of your activities and games. We’ve created a variety of game types for you to select from. You can use an unlimited number of games in whatever sequence you wish. Drag the answer into the appropriate spaces. 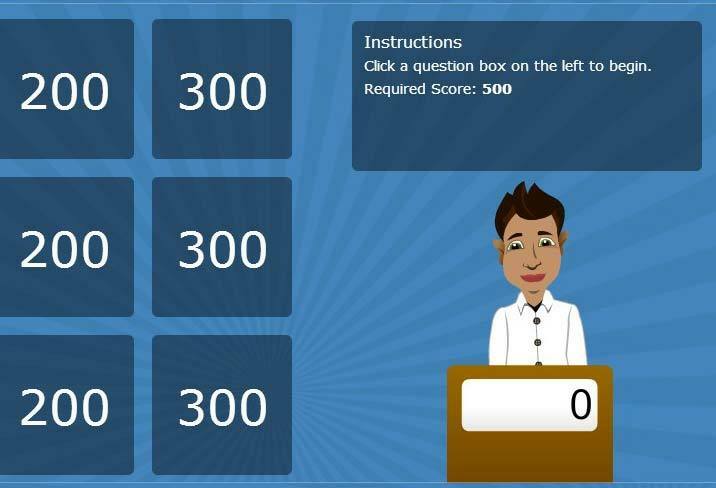 Like a popular gameshow, your learners collect points for correct answers. A fun multiple choice game. 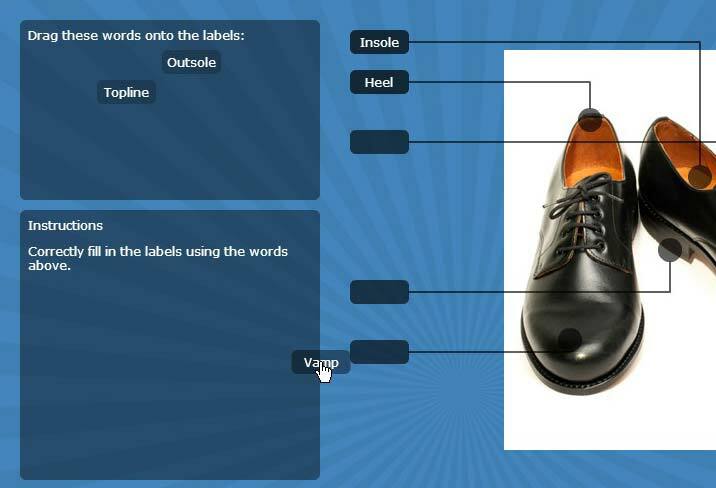 Have your learners correctly label a diagram/illustration/schematic. Our SmarterGames™ allow your learners to practice, which is critical for retention. The options are limitless. The SmarterU online training system provides you with a huge number of options to create highly customized quizzes and exams. Specify the passing grade - either by percentage, a letter grade, or other. Recognize importance by assigning question weights to different questions. The course can be graded as either a pass/fail or percentage. Calculate a final mark based on a multi-quiz average. Draw questions randomly from a large pool, with the ability to set some questions as mandatory. You have the option to randomize the order of quiz questions and answers. Set retry and time limits. Time limits can actually improve quiz scores! Option to require a proctor code to be entered before a learner can start an exam. 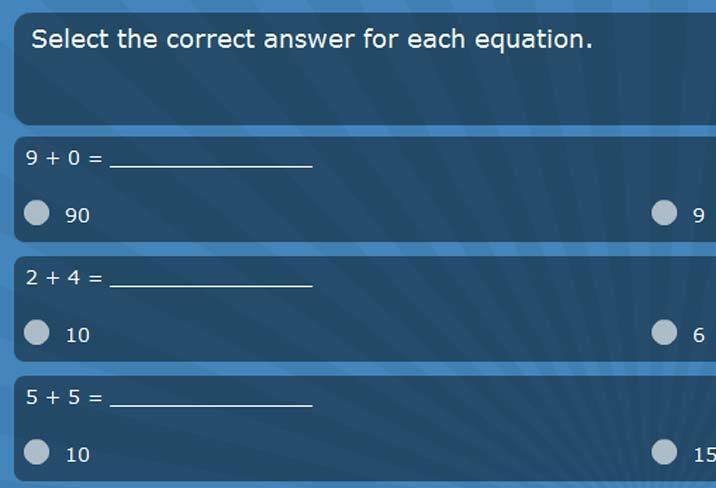 Add audio, text, and graphics to your quiz questions. Scan a learner’s response for one or more of the correct phrases. Have your learner write essay responses, which is then routed to your designated ”markers” who will grade and provide comments, which will route back to the student. 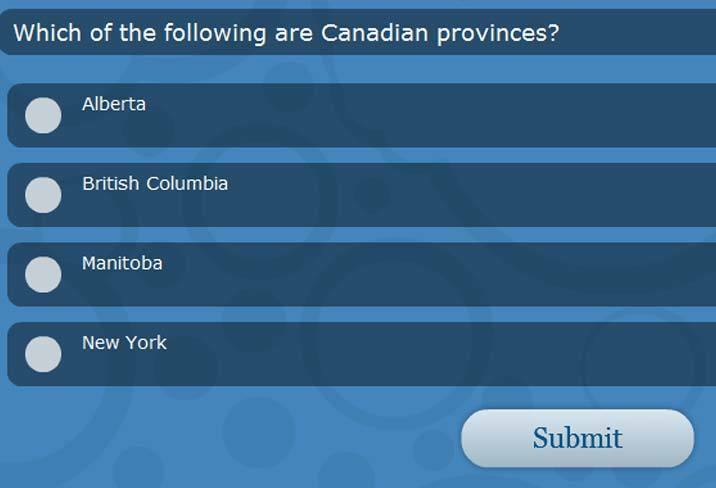 Present options and let your learners pick the right answer from a list of options. Ask questions based on an attached PDF. Ask questions based on a displayed video. Ready to experience exceptional support? Our clients tell us they've never worked with a more responsive vendor. The SmarterU LMS provides blended training options that will empower your team and engage your learners. No third-party software needed! 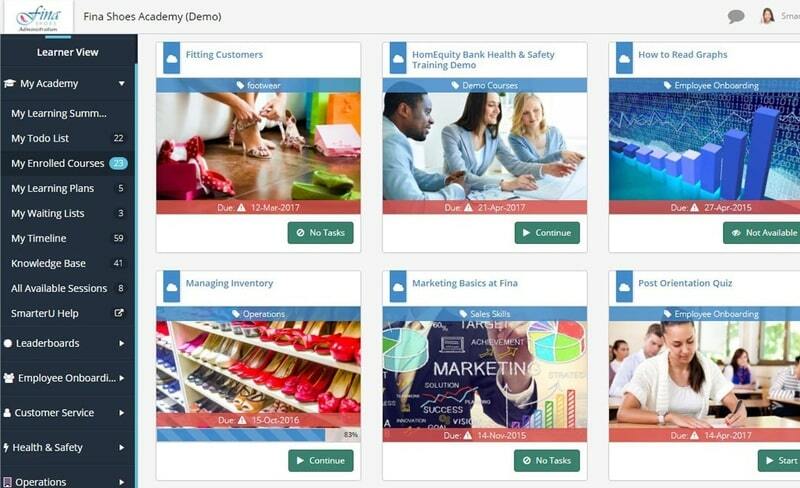 Our integrated online training course builder makes it easy to build engaging courses using text pages, video, games, PowerPoint™, PDF™, quizzes, and exams. 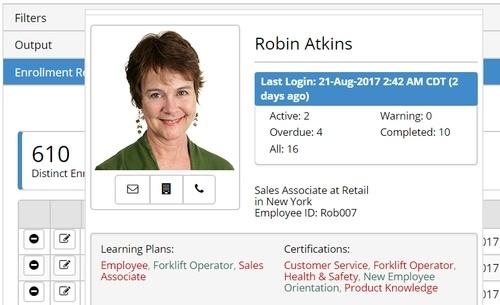 Use the SmarterU LMS to schedule your in-person or live webinar sessions, plus record attendance and document performance. Import your courses into the SCORM/AICC/xAPI-compliant SmarterU learning management system. Track this information in the SmarterU Knowledge Base, and have one place to keep documents, product sheets, forms, and more. Easily sort, filter, and search documents. 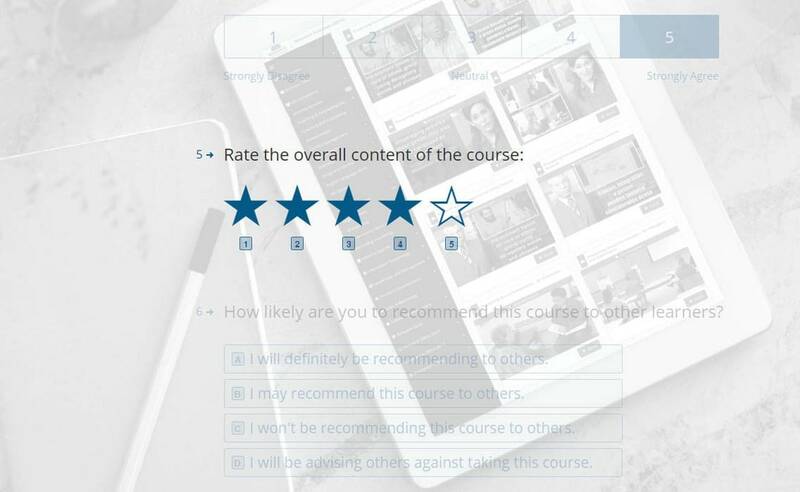 The perfect complement to your elearning courses. Meet The SmarterU Knowledge Base. 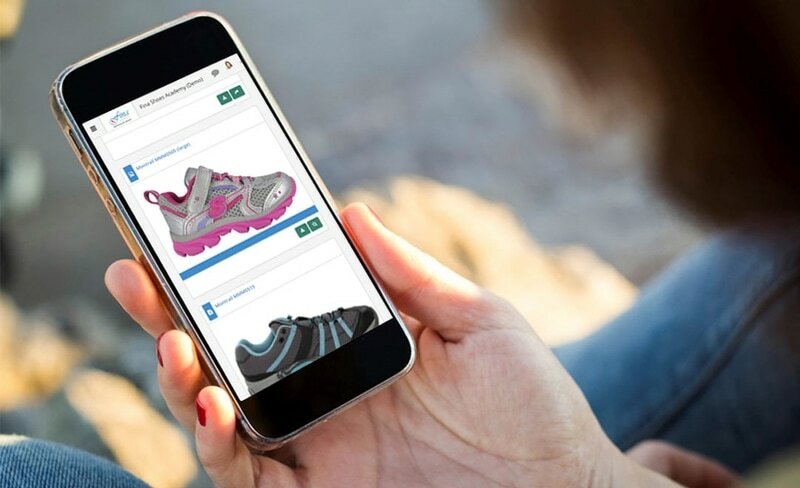 Your knowledge base is fully responsive and accessible by mobile, tablet, or desktop. Drilldown usage stats of each of your articles – find how many times each article has been viewed, edited, or downloaded. Upload and organize all of your files - Powerpoint, PDF, MS Office, videos, audio files, etc. Plus, also embed media from services such as YouTube, Vimeo, Prezi, Animoto, etc. Along with files, maintain wiki-style pages of content that are easily updated just through a browser. Data can be very telling but sometimes, it's great to hear it from the source. Allowing your learners to provide post-course evaluations can help you gain a better understanding on the experiences of your learners as they proceed through their training. Surveys can be created in Typeform or Survey Monkey -- so easy!